"Despite the numerous times I have seen Ron and Nancy Spencer present their act it has never palled, the freshness and apparent spontaneity of their interaction (not to mention the challenge for the magician of endeavouring to detect their methods!) has captured the imagination. For much of the second half of the twentieth century Minds in Harmony brought pleasure and mystery to audiences. 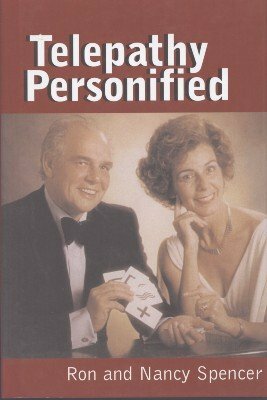 Now, as Ron and Nancy have retired from performing, they have decided to divulge the details of their techniques, a decision that will be welcomed by those who wish to emulate them as well as by those who are simply curious to learn how it was done. Hard work is the short answer but the reader will find everything he or she needs to set about mastering a two-person telepathic act and one that can be constructed from material that has been tried, tested and proven to be hugely successful." The Spencer's complete act is revealed here for the first time anyone with the desire to learn a baffling two-way telepathy act need look no further. This wonderful book has 140 pages together with numerous line drawings and photographic illustrations. It is a large format hardback volume (nine-and-a-half inches by 6-and-a-quarter inches) printed on high quality paper with a full colour, glossy-laminated dust jacket. 1st edition 2005, 139 pages.